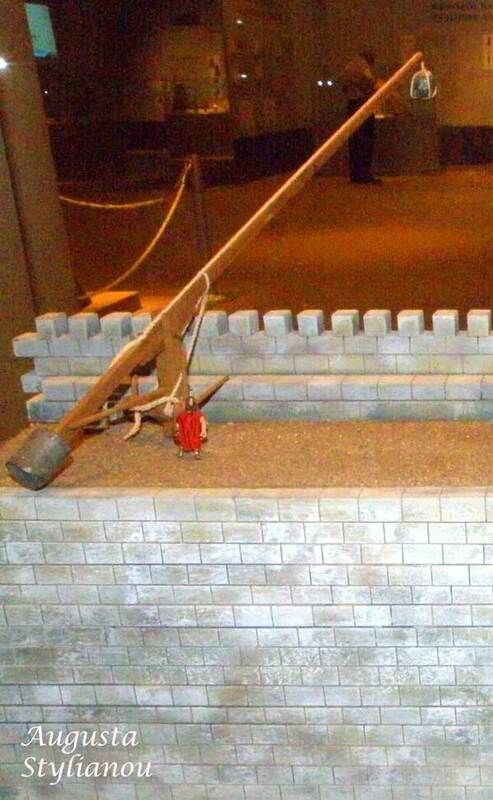 A defensive war machine invented by Archimedes to face Roman ships in the siege of Syracuse. It consisted of a jointed beam based on a rotating vertical beam or platform. At one end of the beam was a counterweight and at the other end a load was suspended by rope (for example a large stone or a lead weight). When not used, the machine was laid alongside the wall in a horizontal position (so as not to be visible from the sea)m wound and secured by rope and a manual winch (for balancing the counterweight). When a ship approached the wall, the operators released the winch so thet the end would gradually ascend enabling the load to pass over the wall by rotating the balance beam (via horizontal levers). When the load was above the ship, the rope was cut so that it would fall onto the target with great force.